Summary: In this illuminating and deeply moving memoir, a former American military intelligence officer goes beyond traditional Cold War espionage tales to tell the true story of her family—of five women separated by the Iron Curtain for more than forty years, and their miraculous reunion after the fall of the Berlin Wall. Forty Autumns makes visceral the pain and longing of one family forced to live apart in a world divided by two. At twenty, Hanna escaped from East to West Germany. But the price of freedom—leaving behind her parents, eight siblings, and family home—was heartbreaking. Uprooted, Hanna eventually moved to America, where she settled down with her husband and had children of her own. 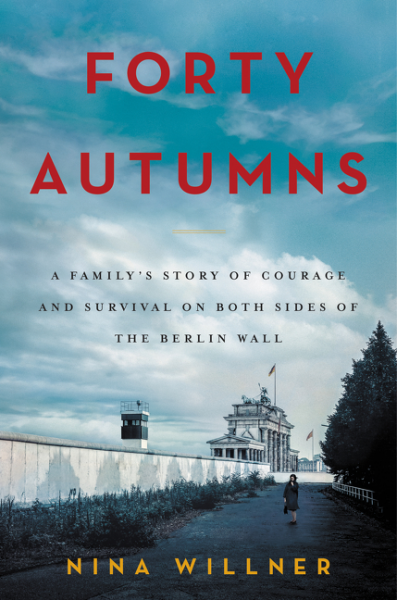 A few weeks ago, my book club met to discuss FORTY AUTUMNS: A FAMILY'S STORY OF COURAGE AND SURVIVAL ON BOTH SIDES OF THE BERLIN WALL by Nina Willner. I loved that we selected this book and really enjoyed reading it. We rarely read nonfiction and this memoir about a family who lived on both sides of the Berlin Wall was both interesting and touching. FORTY AUTUMNS is written by a former American military intelligence officer whose family was divided when the Berlin Wall went up. The book delves into the lives of five women who were separated for over forty years as well as their eventual reunion. Hanna is the twenty year old daughter who was brave enough (and smart enough) to escape from East to West Germany before the wall was constructed; however, she did this at the expense of seeing her parents and eight siblings. Hanna eventually moved to America and started her own family there. Hanna's daughter is Nina Willner, the author of this book. Nina became the first female Army Intelligence Offier to lead intelligence operations in East Berlin during the Cold War. Talk about a family's story coming full circle, right? She brings a unique perspective to this book because she understands the history and politics of the time due to her career, but she also has the gut-wrenching story of her family and their separation which make the book even more poignant. I found FORTY AUTUMNS to be fascinating. As I read this book, I kept telling my husband things about East Berlin and what took place there during the Cold War. My husband reminded me that I was alive for much of the book, and I was even in college when the wall finally came down; however, so much of what took place in this book was new to me. I don't know that I ever truly understood the enormity of this situation until I read FORTY AUTUMNS. I am still shocked that there was a wall dividing a city... and more importantly, families. Imagine knowing that your loved ones were only a mile or so away and you couldn't see them. It's almost incomprehensible for me. And the differences in how the individuals on each side of the wall lived is beyond comprehension. There are many examples of the difficulties those living in East Germany faced, but a few really resonated with me. For instance, it took almost 15 years to get a car from the time you signed up for one; and there were actually towns in East Germany (and therefore family and friends) that you couldn't visit because they were too close to the border. And those are relatively minor things when you consider that all of your communication was being monitored and people were taken away for not "obeying" the rules of the land. I will admit that I enjoyed the first two thirds of the book more than the last third. I thought I would be fascinated by the "spying" and intelligence gathering aspect of the book; however, I found the story of the family members to be so much more interesting. I think the human aspect of the story just made the actual historical events so much more real to me, and I couldn't help but think about just how many families were torn apart for decades. I was actually surprised by how much FORTY AUTUMNS moved me. I do think FORTY AUTUMNS is a good selection for books clubs. There is a reading guide with twenty (!) discussion questions. We didn't actually go through the questions one by one, but I did use the guide as a way to steer conversation. Some of the topics you might want to explore include parent/child relationships, loss, grief, mental health, courage, principles, beliefs, and perseverance. Overall, I think FORTY AUTUMNS is an excellent way for readers to learn more about the Cold War on both a historical and personal level. Highly recommended. This is the kind of memoir I love to read. It does sound fascinating as you say. I've always wondered how families who've undergone such drastic situations in life have survived it all. I'm kind of embarrassed to admit that I don't know much about the wall and Berlin either. I love memoirs so this sounds perfect for me.